A group of 17 Anglican Bishops from all six continents have called for urgent prayer and action on the “unprecedented climate crisis”. Their Declaration The World Is Our Host: A Call to Urgent Action for Climate Justice released today sets a new agenda on climate change for the 85 million-strong Anglican Communion. The group met in South Africa in February to build on months of conversations carried out via the internet. The group involved bishops both from cultures and nations that are major contributors to climate change, and those producing low levels of CO 2 but disproportionately affected. “We accept the evidence of science: Human activity, especially in fossil-fuel based economies, is the main cause of the climate crisis. We heard of extreme weather and changes to seasons; rising sea levels; acidification of seawater; depleted fishing grounds; and displaced people who are climate refugees. Archbishop Thabo Makgoba wraps up our Lenten series with a reflection for Palm Sunday. Archbishop Thabo Makgoba of Cape Town is to deliver a memorial lecture honouring the Right Revd. Alphaeus Zulu, former Bishop of Zululand, in Durban on Monday March 30. Alphaeus Hamilton Zulu, born in 1905, was a pioneering leader of the Anglican Church of Southern Africa. Initially a teacher, he was ordained a priest when he was in his 30s and served for many years at St Faith's Mission in Durban. During this time, he became one of the founders of Iviyo lofakazi bakaKristu, a renowned movement in the Anglican Church. He was the first black South African to be consecrated an Anglican bishop, becoming Bishop Suffragan of the old St. John's Diocese in 1960. He then became the first black diocesan bishop, serving as Bishop of Zululand from 1966 until his retirement in 1975. During this time, he was also a regional President of the World Council of Churches. After he retired, he was appointed Speaker of the KwaZulu Legislative Assembly from 1978 to 1987. On Tuesday March 24 2015, the National Church Leaders Forum – which was recently launched as part of the South African Council of Churches renewal program – announced its intention to address the increasing dissonance within the South African socio-political space. As a body of church leaders across the broader South African spectrum, the Forum is alarmed at the perceived "cancer of corruption" rapidly chipping away at the core of the South African moral fibre from every angle of our society; the creeping disregard for the Constitution as well as the debilitating instability playing itself out at key government and parastatal institutions. These all reflect a worrying trend that, if left unchecked, could prove dire for the future stability of this country. The church leaders are calling on South African churches to commit themselves to pray and act for the advancement of the South African post-apartheid promise. This call is extended to all South Africans. The goal is to realise a just, reconciled, prosperous and equitable society; free of hunger and want, free of racial, tribal and gender prejudices, free of corruption and deprivation, and with enough food and shelter for every citizen. The SACC will shortly be announcing its participation in the War of Poverty, in collaboration with all three tiers of government, building on existing pilot programs with proven success. May I speak in the name of God who knows each tree by its fruits and who separates the bad tree from the good one. Amen. Dear Brothers and Sisters in Christ, let me repeat what a great delight it is to be with you and to be licensing and inducting Roger as CEO of ABESA tonight. Roger, we offer you hearty congratulations on this appointment and we warmly welcome you and Ann to this key ministry of our Church. Let me also congratulate the Board on this appointment, an excellent choice. We know that Roger comes with extensive experience in educational excellence and a deep mature, Christian faith. We look forward to harnessing these good fruits for both the Church and the nations of ACSA. Archbishop Thabo Makgoba of Cape Town will today license the Revd Roger Cameron, recently-retired head of St. John's College, Johannesburg, as the Chief Executive Officer of the Anglican Board of Education in Southern Africa (ABESA). "This is a significant event in the life of the Church," said Archbishop Makgoba. "I am exhilarated by the potential of ABESA to reclaim the Church's role in education and thus promote what I call 'the new struggle' to create opportunities for young people in practical ways. "It is one of my key ambitions to build new, quality Christian schools, easily accessible to all. We also want to galvanise parishioners to be involved and to work with existing independent schools in creating new opportunities for young people." The licensing will be attended by Bishop Peter Lee, who chairs ABESA, and Bishop Steve Moreo of Johannesburg. Dr Vicentia Kgabe, Rector of the College of the Transfiguration in Grahamstown, South Africa, reflecting on the story, in John's Gospel, of the Greeks who came asking to see Jesus at the Passover festival, asks who young people might want to see today. Is it Beyoncé, or Miley Cyrus, or Patrice Motsepe, or even CR7 or AB de Villiers? An appeal for prayers and for practical aid for the people of the South Pacific Ocean in the wake of Cyclone Pam has been issued by Archbishop Thabo Makgoba, Chair of the Anglican Communion Environmental Network. “Having just hosted a meeting of eco-bishops from around the Communion, including Bishop Api Qiliho from Fiji, the network is particularly aware of the threat posed by climate change to the people of the South Pacific. “We have been shocked by the devastation wrought by Cyclone Pam, particularly in Vanuatu in the neighbouring Province of Melanesia. “Our prayers go out to the families of those who have died, to those who have been displaced and to those who have lost their homes and property. We express our deepest condolences to the families of Minister Collins Chabane, Sergeant Lesiba Sekele and Sergeant Lawrence Lentsoane following their deaths in a car accident early today. I appeal to all people of faith, please lift their families up in prayer at this time. Bishop Rubin Phillip of Natal, Dean of the Province, reflects for the fourth Sunday in Lent on abundant life, and on God's desire that we should bring it to all. The meetings have included a gathering of members of the Anglican Global South, chaired by the Most Revd Dr Mouneer Hanna Anis of Egypt, President Bishop of the Anglican Church in Jerusalem and the Middle East. Minister Maite Nkoana-Mashabane, South Africa's Minister of International Relations and Cooperation, and Premier Helen Zille of the Western Cape sent messages of welcome to the delegates and their spouses. Archbishop Makgoba said the meetings were a tangible expression of the Anglican family belonging together. He expressed hope that the meeting would renew relations among churches across Africa. 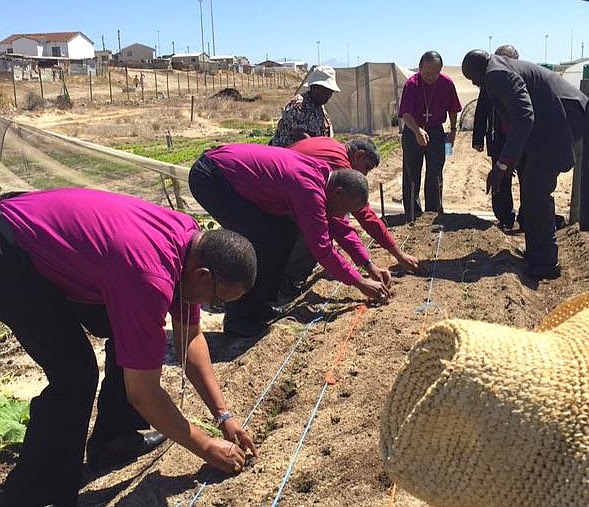 On the first day, participants visited Masikhanye Food Garden in Khayelitsha, an urban food project supported by the Anglican Church of Southern Africa's outreach arm, Hope Africa. 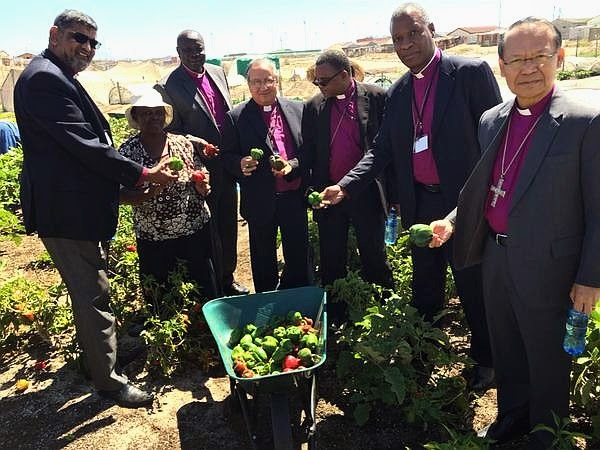 Archbishops plant onions at an urban food project in Khayelitsha, Cape Town. The visitors included, from left, Archbishop Ian Ernest of the Indian Ocean, Archbishop Ezekiel Kondo of the Internal Province of Sudan, Archbishop Mouneer Anis of the Anglican Church in Jerusalem and the Middle East, Archbishop Jacob Chimeledya of Tanzania, Archbishop Thabo Makgoba of Cape Town and Archbishop Bolly Lapok of South-East Asia. Archbishop Thabo Makgoba has commended firefighters and volunteers involved in the battle against the fires in the southern part of the Cape Peninsula. "We stand in admiration of those who have been fighting the fires and for the volunteers who have worked tirelessly to support them. We express our solidarity with those treated for smoke inhalation and who have lost property in the fires. "The Anglican agency, Hope Africa, reports that while enough food has been donated, there is still a need for sunscreen, eye drops, throat lozenges, Energades and gloves. They can be delivered to the Lakeside and Newlands fire stations. "Cash donations can be sent to to Volunteer Wildfire Services: Nedbank Foreshore, Branch code – 108309, Acc. No: 1083321226. "I urge Anglicans to donate generously."